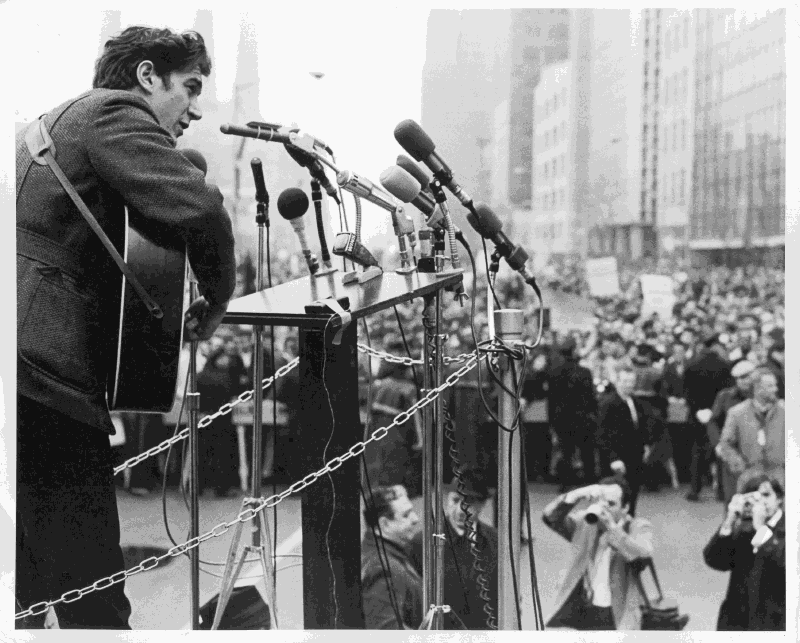 The wait is over The Phil Ochs documentary, “There But For Fortune” is opening at Laemelle theaters in L.A.on Friday March 4th! It has been breaking records in New York since it opened last month. AW- How long did it take to make the film? AW- How about an interesting story? MO- I had actually approached Michael Cohl when I was selling the Archives to see if he would be interested. He had absolutely no interest in buying the Archives but had heard about the doc. Ken and I were working on. Turns out Cohl started in the biz with a folk club in Toronto and had booked Phil early on. Cohl said he loved Phil as an artist and as a person and would love to back the film. So, inadvertently, my selling the Archives got this film done. AW- With the current political unrest in the US, which of Phil’s songs should be re-examined? MO- It’s possible for the individual to effectuate change. And, don’t follow leaders or parking meters! Thanks to Michael Ochs for mini-interview… Now here’s a preview of the film. 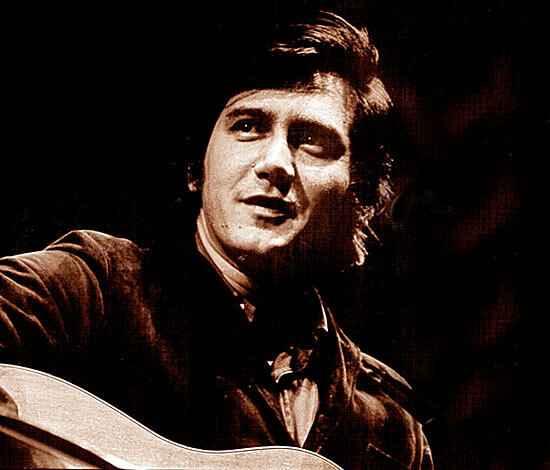 Tags: MICHAEL OCHS, PHIL OCHS, Phil Ochs documentary "THERE BUT FOR FORTUNE"
The last time I saw folk singer/ activist Phil Ochs was at a small celebration the day that Nixon resigned live on TV. His brother, and my friend, publicist Michael Ochs, arranged for an NBC-TV crew to record Phil’s reaction to his arch enemy’s fall from power…while we all cheered! It must’ve been one of the most gratifying times in Phil’s life to see the evil that he fought so hard against in his songs brought to his knees. It was the songs of Bob Dylan and Phil Ochs that drew me into the folk song protest movement of the early sixties, up until then I was just an other Brill building songwriter with a pop music monkey on his back! For a while I followed in the footsteps of my “folk” heroes and played in Greenwich Village on hoot nights at the Bitter End and Gerde’s Folk city, with Paul Simon and Roger McGuinn backing me up on guitar. Then I lost interest in becoming the next Pete Seeger (when no one would actually pay me to play in their club) and I became a songplugger. I look back in retrospect and realize how lucky I was to grow up and experience what I did in the middle of the Folk Movement. 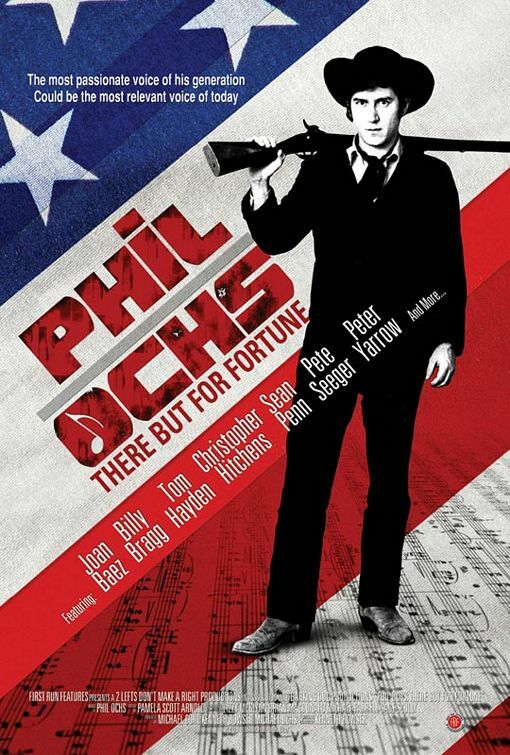 I can’t wait to see the documentary on Phil Ochs, “There But For Fortune” which is playing to sell out crowds in New York and relive some of those incredible times. As I was going through the YouTube collection of Phil’s Videos I wanted to post, I realized I haven’t heard most of the songs in over 30 years. I also realized that many of them are as timely now as when Phil wrote them. The preview of the Phil Ochs Documentary makes a point that, “Those who cannot learn from history are doomed to repeat it”. I can understand why so many people who are disappointed in the lack of content in today’s music are re-examining Phil’s songs as blueprints for a better present and a more promising future.